A stunning option for framing your precious photos, sketches, and prints, the Blick Monroe Photo Frame has a soft brushed finish that gives it a distinctive look. 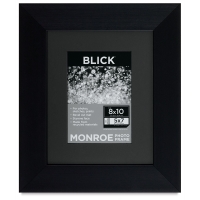 Made from recycled materials, the Monroe Frame has a 2" wide contemporary flat profile and is available in a range of rich finishes, including Gold, Graphite, and Black. Every frame comes with a pH-neutral, bevel-cut mat, plus a styrene face and a cardboard backing. Hanging hardware (a sawtooth hanger on the 8" × 10" through 12" × 16" sizes, and a D-ring and hanging wire on the 16" × 20" size) is also included. 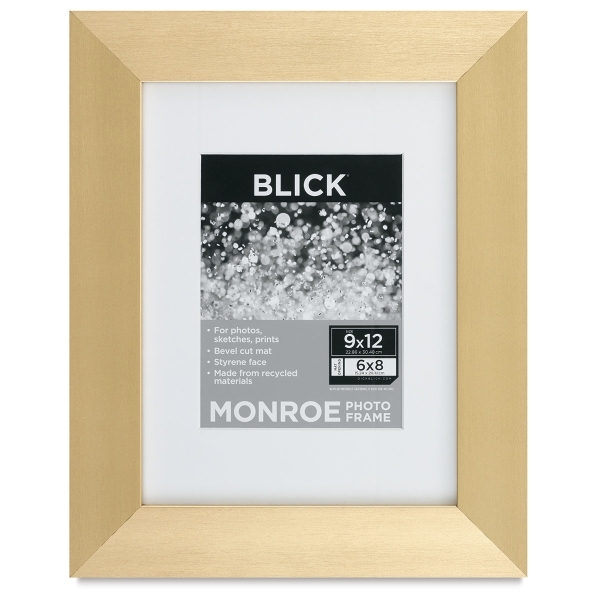 The Gold frame features a white mat with a white core. 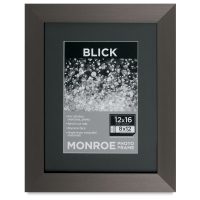 The Graphite frame features a dark gray mat with a white core. The Black frame features a black mat with a white core. Both measure 3/4" deep, with a 7/16" deep rabbet. 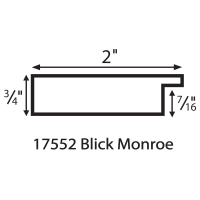 The Monroe ships with a styrene face, as styrene is lighter than glass and less likely to shatter in transit. The styrene face has a protective film on both sides that protects it from scratches and smudges. The film should be removed before displaying your art.